Kahn Trio - ithay-khens Webseite! The violinist Ilan Schneider and the cellist Ithay Khen were already playing music together during their years as students in Tel Aviv. Since then the paths of both soloists have crossed again and again in various chamber music ensembles in different parts of the world. 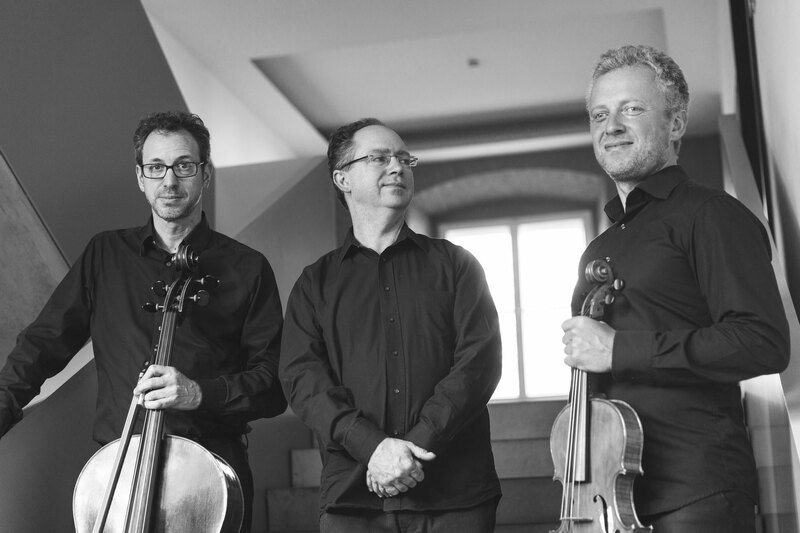 With the pianist Frédéric Sommer the two finally formed the Kahn Trio, a grouping which delivers a very special combination of sounds. The two string instruments, known for their warm, sonorous and wide tonal spectrum, unite with the piano in an ensemble with a great variety of aural possibilities. 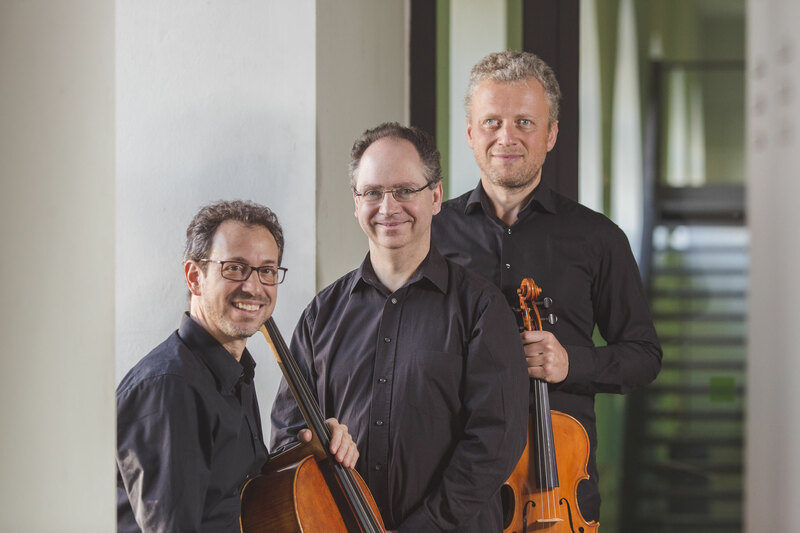 The Trio's repertoire extends from well-known works like Johannes Brahms' Trio Op. 114 to those less frequently performed, like Robert Kahn's Serenade Op. 73. The Trio has a special link to the composer Robert Kahn; Kahn, who came from a Jewish family, had to flee Germany to England in 1938, which spelled the end of his musical career. He had already made a name for himself in Germany with his compositions before the Nazis took power. After the war, the formerly celebrated composer lapsed into near-obscurity and it is only since the onset of the new millenium that his works have begun once more to attract attention. The powerful expressiveness and tonal beauty of Kahn's works have nourished the enthusiasm of the three musicians. It was not a difficult decision to name the Trio after Robert Kahn and thus to contribute to the posterity this special composer has earned. Ilan Schneider was Born in 1968 in Lithuania, he received first musical education in his native town, Vilnius. At the age of 15 followed his family to Israel and continued his studies at the Rubin Academy of Music in Tel Aviv. In 1989 Schneider won the first prize of the Violin Competition of the Rubin Academy of Music. Later he resumed studies with members of the Alban Berg Quartet at the University of Music and Performing Arts in Vienna. Schneider studied with the virtuoso violist, Michael Kugel from 1997. In 1998 he achieved a major success at the First International Viola Competition in Vienna. In 2003 Schneider graduated with highest distinction from the Royal Conservatory in Ghent. Schneider gives regular master classes in the Netherlands, Italy, Belgium, Croatia and Lithuania and judges international competitions. Numerous recordings of solo and chamber music by Ilan Schneider have been produced by the labels in Luxembourg, Germany, and France and have received distinctions from the international press, such as the “Diapason d’Or” and the “Strad Selection.” Newest recital-CD was selected as the “CD of the month” by “The Strad” magazine. Ithay Khen received the Clermont-Award as the best young Israeli cellist along with first prize at the cello and chamber music competition, Rubin Academy Tel Aviv. Towards the end of his studies, he was a scholarship holder at the Herbert von Karajan Orchestra Academy of the Berlin Philharmonic Orchestra which included numerous concerts and concert tours. Since then he has often played in chamber music ensembles with members of the Berlin Philharmonic. From 1996 to 1997 he held a position as a solo cellist of the Royal Philharmonic Antwerp before becoming the first solo cellist of the Nuremberg Opera. He performed as a soloist with numerous orchestras such as the Budapest Symphony Orchestra, the Royal Philharmonic Antwerp, the Marienplatz Bader Festival Orchestra, the Arta Viva Sorbonne, the Orchestra of the Theatre Trier, the German Chamber Orchestra of Berlin and the Israel Chamber Orchestra. Touring as soloist also led him to Japan, the United States, Israel, Germany, Belgium, the Czech Republic and Poland. Besides numerous television productions from ARD, ZDF, NDR and the Israeli and Swedish television, Ithay Khen also worked on countless radio recordings of RBB Kulturradio, Deutschlandradio and classical radio Kol HaMusika Israel. His CD recordings include the two Brahms Sextets, chamber music by Boris Blacher, the cello concert and chamber music of the Israeli composer Shimon Knol as well as many CD’s with romantic and contemporary works for cello and piano. Ithay Khen worked world wide as a lecturer teaching at master courses such as the International Summer Festival of the Rubin Academy / Jerusalem, the International Festival of Burgos/ Spain, the Summer Music Festival Glukholazy / Poland, Euro-Nippon Alden Biesen/ Belgium, and the Winter Academy Castle Kröchlendorff / Germany. Frédéric Sommer erhielt seine pianistische Ausbildung in Paris bei Prof. Dominique Merlet. In Stuttgart setzte er seine Studien sowohl im Fach Klavier, als auch in der Liedklasse bei Prof. Konrad Richter bis zum Solistenexamen fort. Er übernahm auch an der Staatsoper Stuttgart den Klavierpart für die Produktionen „ die Gezeichneten“ von Franz Schreker, „ Moses und Aron“ von Arnold Schönberg, Strawinskys Petruschka und „Der Bürger als Edelmann“ von Richard Strauss unter der Leitung von GMD Lothar Zagrosek und Mark Albrecht. Frédéric Sommer ist außerdem ein viel gefragter Kammermusikpartner und Liedbegleiter und entfaltet sein künstlerisches Können in zahlreichen Festivals und Meisterkursen. Liederabende mit dem Sänger Matthias Klink und die Sängerin Natalie Karl gehören zu den schönsten musikalischen Momente seiner Bühnenkarriere. Seit 2000 Unterrichtet Frédéric Sommer als gefragter Dozent und Korrepetitor an verschiedenen Musikhochschulen in Deutschland. Seit 2013 lebt der Pianist Frédéric Sommer als freischaffender Künstler in Berlin und betreut als Korrepetitor an der Hanns Eisler Musikhochschule die Flötenklassen von Herrn Prof. Fromanger und Sylvia Careddu.